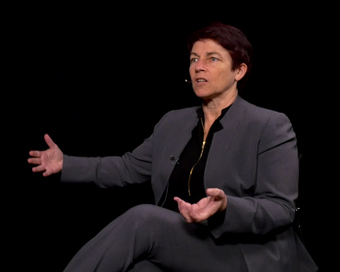 Andra Keay commands a prestigious position at the heart of the Silicon Valley robotics sector, regularly dealing with governments and Fortune 500 companies. The former TV camera-woman, however, took the scenic route to success in one of the world’s most fascinating industries. As a child it seemed she was destined for a career in outer space. Keay was obsessed by space, robots, gadgets and technology and was passionate about maths and science and received great encouragement from her parents – Dad, an astrophysicist, Mum a teacher. “My father encouraged me to love space and rockets and my mother encouraged my interest in chemistry and archaeology,” she recalls. The little girl, who was born in New Zealand and moved with her family to Australia at the age of five, dreamed of becoming an astronaut. However, by age 10, recalls Keay (55), now the Managing Director of Silicon Valley Robotics (SVR), it had become disappointingly obvious that the right career path wasn’t in place for her. Back then, she says, many people simply didn’t have the confidence to see or understand the true potential of the internet. “They just didn’t see the need,” she recalls, observing that often “the real value of innovation or an invention actually turns out to be something nobody has thought of.” If we look back on history, she observes, it’s very clear how often we miss the real potential of an invention. Soon after her youngest child went to school in 2004/2005, Keay returned to college to do a Master’s Degree in Robotics part-time, finishing the course in 2011. “I had long been interested in robots, but this was an area that was not being developed.” The industrial robots that were being constructed at the time worked extremely well, she says and were, she acknowledges, “beautiful, precise machinery,” which, however, had none of the rudimentary intelligence of even the most simple science fiction robots. In 2011 the family moved to the US, settling in the world-famous Silicon Valley. Keay’s husband had been offered a job there, and while he settled in, she put the finishing touches to her Master’s Degree. At the time, she recalls, the robotics sector in Silicon Valley was thrusting ahead: “I was interested in the commercialisation of robotics. There was a lot happening in Silicon Valley in robotics, that the rest of the world was simply not aware of. Undeterred by the public’s bland obliviousness, the Silicon Valley robotics companies decided to form an industry group to let people know what was going on. They set up Silicon Valley Robotics in 2010 – and a year later Keay moved in to run it. Initially, she recalls, SVR was like a mission statement to tell the world what was happening in robotics. After pointing out that they needed a website, and should be running the right kind of events and actively promoting new concepts and innovations, she got directly involved in whipping SVR into shape: “It was an idea that the robotics companies had, and I turned it into a reality,” she explains. A major problem at the time was that because nobody knew much about robotics sector, funding was extremely difficult to attract – but that’s changed. “We find now is that the investment community is very interested in robotics and it is coming to their horizons as the technology of interest. More and more people are looking at robotics and seeing that it will have an impact, and they want to understand what is happening.” Now the organisation is fielding calls from the governments and Fortune 500 companies who want to know what the new trends are. It also, she says, engages in activities that enhance the quality and quantity of the next generation of robotics professionals, and advocates for robotics policies that promote innovation and entrepreneurship as well as recognising industry-leading companies and attracting thought leaders. “We see the trends from the very beginning and we actively try to support companies over the speed bumps in their path on the road from research into the real world,” says Keay who recently attended the Web Summit in Dublin, to give a keynote address on Life With Robots and participate in several panel discussions. Within a matter of years she believes, robots will become part of life in the more technologically advanced parts of the world – already many giant Californian hardware stores offer the services of an Oshbot which can tell customers where to find particular items on the shelves, and even physically bring them directly to where the required product is stocked in the store.